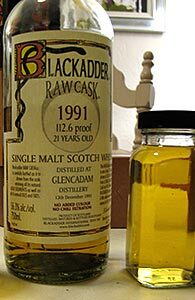 Hot on the heels of my review of the Ledaig 10, and picking back up the run of reviews of smoky whiskies, here is an even younger Ledaig, this from a single sherry cask and released by the indie outfit, Blackadder. 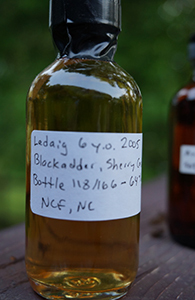 I’ve previously reviewed another Ledaig 6 that I rather liked and I’m interested to see how this one compares. 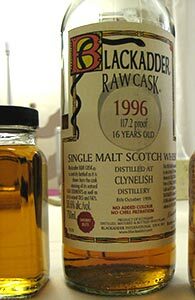 This Clynelish was purchased and split at the same time as this Glencadam, also bottled by Blackadder. I thought that Glencadam was fine but nothing special. Will this Clynelish be much better? So far I have to say my experience with sherried Clynelish has been mixed. I loved this older one from Chieftain’s bottled for K&L but was less excited about two teenagers from Whiskybroker and Signatory (though I did think the Signatory improved markedly after the bottle had been open for a while). Well, let’s get right to it. Glencadam is a highland distillery about which I know very little. I’ve had their 10 yo which presents excellent bang for the buck (or at least it did–I haven’t looked at prices recently) and have unopened bottles of their 15 yo and 21 yo (the newer versions at 46%), and a couple of indies in the stash. Unlike most Scottish distilleries they’re not owned by a big conglomerate–unless, that is, Angus Dundee Distillers is a front for Time-Warner–but they’re not a quaint family outfit either: to get a sense of romance Angus Dundee-style, read this page. None of this, of course, says anything about the quality of their whisky.